Introduction: Cystoscopy is widely used on diagnostic and follow up of bladder cancer. Men undergoing cystoscopy feel considerable discomfort due to the anatomical condition of the male urethra, which is low and narrow. Level of anxiety previous to the exploration seems to influence on pain perception. 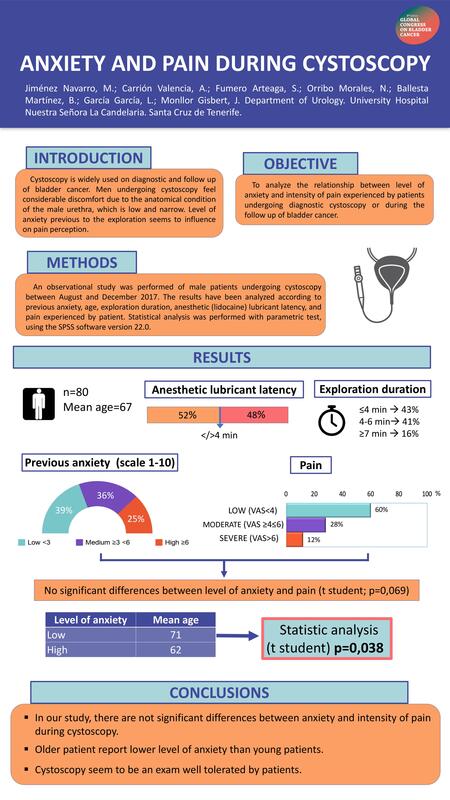 Objective: To analyze the relationship between level of anxiety and intensity of pain experienced by patients undergoing diagnostic cystoscopy or during the follow up of bladder cancer. Methods: An observational study was performed of male patients undergoing cystoscopy between August and December 2017. The results have been analyzed according to previous anxiety, age, exploration duration, anesthetic (lidocaine) lubricant latency, and pain experienced by patient. Statistical analysis was performed with parametric test, using the SPSS software version 22.0. Results: A total of 80 patients were recruited. Mean age was 67. The level of previous anxiety (scale 1 to 10) was low (<3) in 39%, medium in 36% (≥3 <6) and high (≥6) in 25% of patients. Exploration duration was ≤4 minutes in 43% of cases, between 4 and 6 minutes in 41%, and ≥7 minutes in 16%. Anesthetic lubricant latency was <4 minutes in 52% and >4 minutes in 48% of patients. Pain experienced was low (VAS <4) in 60%, moderate (VAS ≥4 ≤6) in 28% and severe (VAS >6) in 12%. No significant differences was found between level of anxiety and pain referred by patient (t student; p=0,069). Statistically significant differences were obtained in the average age according to the level of anxiety (low anxiety: 71 years; high anxiety: 62 years) (t student; p=0,038). ANOVA test was used to analyze relationship between anesthetic lubricant latency and pain referred by patients, showing that there are no significant differences for a short waiting time (4 minutes) (p = 0.610). Conclusion: In our study, there are not significant differences between anxiety and intensity of pain during cystoscopy. Older patient report lower level of anxiety than young patients. Cystoscopy seem to be an exam well tolerated by patients.